Joint UFO finish...well sort of. Last weekend during our backroom cleaning, David and I unearthed this tree skirt he started from last year....almost finished. He did a wonderful job cutting and piecing the tree skirt. I on the other hand dropped the ball in getting it quilted. After seeing it again, we both realized, it's actually quilted enough, it could be considered finished. So he made the decision to trim it and bind it. The unfinished quilting is pebbling (snow) in the white background of the trees. So it will be no big deal to finish off those pebbles sometime after Christmas. And if I don't finish it, it will make for a great story for future generations. You know, that tree skirt grandma never finished. It feels so good to report that it is currently under our tree, with a few packages on it. The cats are very confused why the quilt is for the boxes and not for their bums. Another finish for the weekend, though not my finish at all, is a small mug rug by David. After spotting some horse fabric in our stash last weekend, he decided to make a mug rug for a co-worker who loves horses. 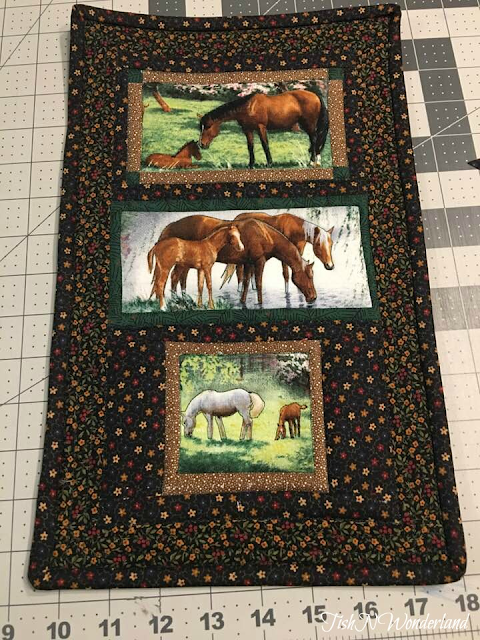 He even quilted it himself, carefully stitching around the horses. They look like they are just popping off the fabric. I was also able to start working on a plan for my Wayward Transparency Quilt. I've been loving all the linear quilting I've seen for this one, but I had hoped to bring some curves to the table with my version. This is currently what is bouncing around in my head. I have ﻿decided to not add borders to it and keep it at 48". With my quilting plan including some very dense quilting, this will be more of a wall hanging than a cuddle quilt. I am determined to get backing fabric this week and start quilting on it. Other than that, I'm preparing for the upcoming first linky party in Wonderland on Wednesday. 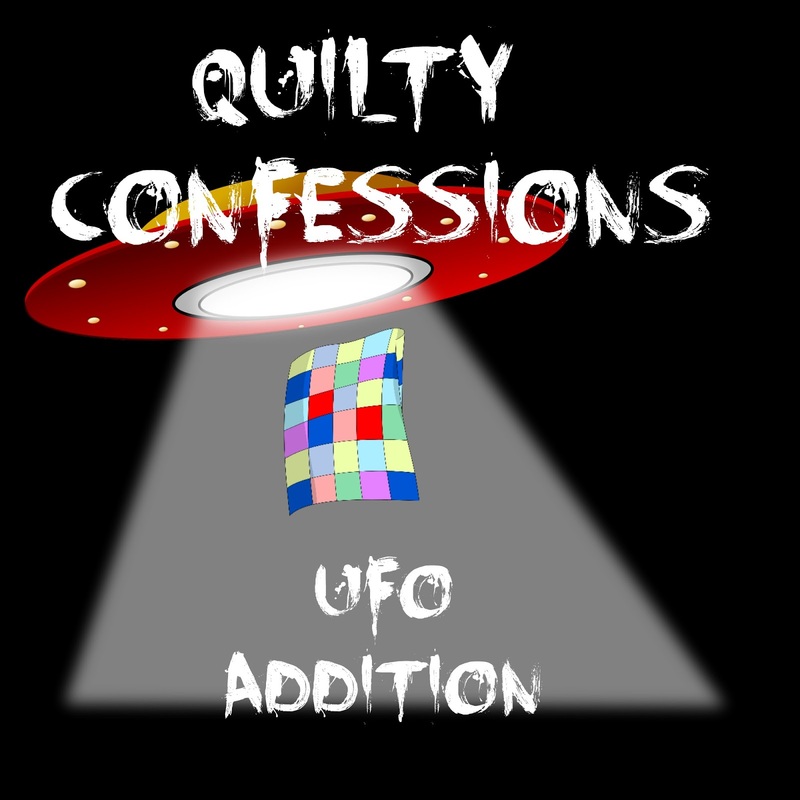 I'm calling it Quilty Confessions; UFO Addition. I've documented all my UFO's and WIP's and I'm ready to talk about them a bit. Discuss my plans on whittling those piles down during 2018, while hopefully not creating more. I hope you will join me on this year of finishes. So come back on Wednesday and let's talk about all those quilty skeletons lurking in your closet, before the UFO Busting Party begins in January. Lovely tree skirt, perfect with that quilting, and already in use. Your wayward design, looks great. 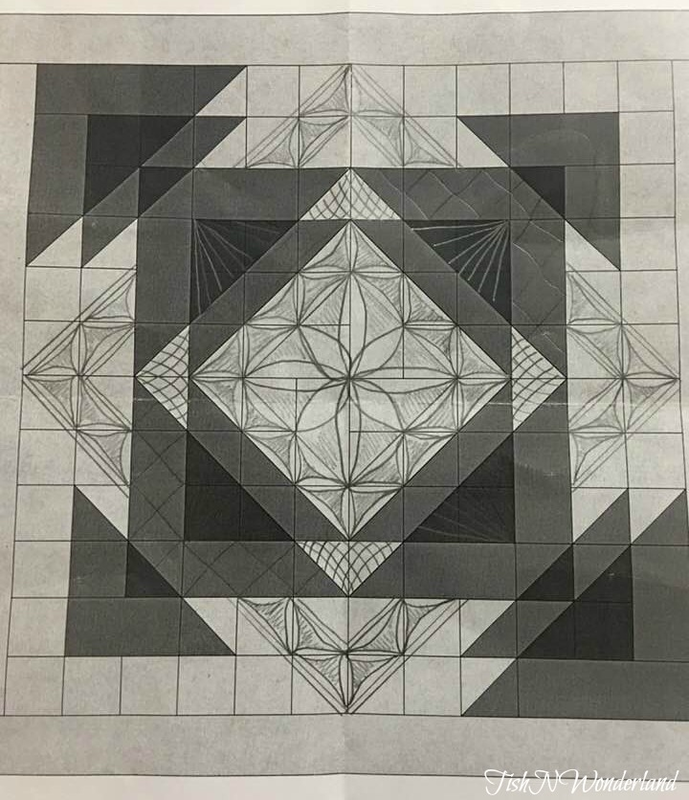 I am really liking that quilting plan you have going on for your Wayward Transparency quilt. It's going to be gorgeous! That linky party sounds like something that might help motivate me! I am looking forward to that post, Tish! The tree skirt is to lovely to not be in use. I love the quilt plan! It always feels so good to finish something. I worked on one of those yesterday, piecing done. Great finish for you just in time to use it. That is a BEAUTIFUL tree skirt. Wishing you and yours a very Merry Christmas. Love the tree skirt! Finished and in use is always best! I'm still not sure how many UFOs I'm ready to expose, but I certainly do have some quilty confessions! Looking forward to it! The tree skirt looks wonderful. I need to figure out a quilting plan for my Wayward quilt. Too much to do, not enough time.